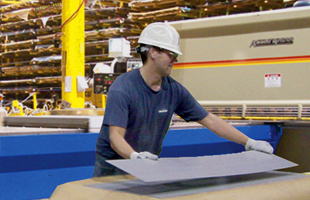 Shearing sheet metal and plate steel is performed in most of Alro’s steel warehouses. We’ll shear your order to your exact specifications, place your material on a skid for safe transporting and safe handling after your order is delivered to your specified location. We are capable of shearing plate up to 1/2" thick. Thickness capacities vary depending on the grade of the material. Please inquire. 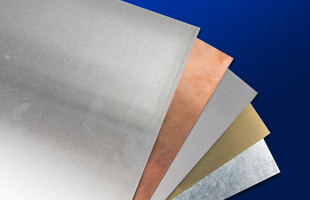 Alro can shear a wide range of metals. See chart below for specifications. 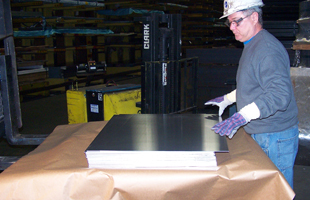 Aluminum 3003, 5052 & 6061 20 gauge 1/2" thick 144" x 144" 1/8"
Aluminum Floor Plate 20 gauge 3/8" thick 144" x 144" 1/8"
Aluminum 2024 & 7075 20 gauge 1/8" thick 144" x 144" 1/8"
Carbon Mild Carbon Steel 20 gauge 1/2" thick 144" x 144" 1/8"
Carbon Floor Plate 20 gauge 3/8" thick 144" x 144" 1/8"
Carbon Medium Carbon 20 gauge 1/4" thick 144" x 144" 1/8"
Carbon AR 235 Plate 20 gauge 1/4" thick 144" x 144" 1/8"
Carbon AR400 Plate 20 gauge 3/16" thick 144" x 144" 1/8"
--- Expanded Metal 20 gauge 9 gauge 144" x 144" 1/8"
Stainless Stainless 20 gauge 1/4" thick 144" x 144" 1/8"
Stainless Floor Plate 20 gauge 3/16" thick 144" x 144" 1/8"
Red Metals Red Metals 20 gauge 1/2" thick 144" x 144" 1/8"
This chart is a guideline only. For more specifc information, please contact your Alro representative.